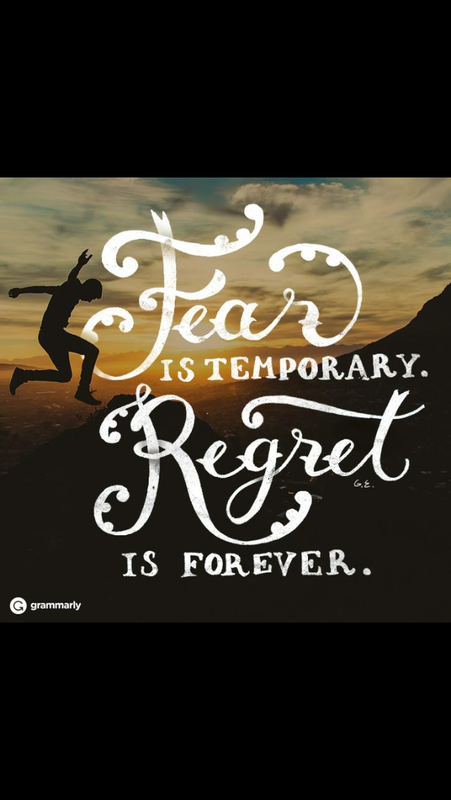 Fear Vs Regret: You call yourself a writer? I loved this quote when I came across it on Pinterest trying to find pins to put on my ‘Rule of Thirds’ ChickLit concept board. Yes, I’m attempting to Pinterest. Can’t say I have tried it before, though I was signed up with it more than a year ago. Never really saw how I could use it to drum up interest for my book(s). But, ever since I came away from a day seminar at the Sydney Writer’s Festival last month, I may have been inspired to try it in a way I never thought about. Use it to create a page/board (still learning it’s lingo here) for the book/story in mind, helping create the look/feel of the novel. So, for the last week, I’ve been searching pins for weddings, love, romance, mother-daughter etc. and still going. Don’t know if it’s been at all successful but can’t hurt to try. What was the point of telling you all that? Well, as writers, and truly anyone who has a job that gets them or their product in front of strangers, go through this regardless of the career path you choose. We are held back by fear. Our potential squashed ruthlessly by the little devil that sits on our shoulders, and whispers ‘it’s not good enough’. Let’s give it a flick off our shoulders. Time to free them shoulders! I believe regret is a painful thing to go through in life, but I’ve also realized personally that fear is the only thing that usually causes one to have regrets in the first place. If you fear about what people will think, then try and divert that fear to but what if they like it. You can’t please every one. This is not Pleasantville. I’m going to try and not fear too much about too much from now on, or at least attempt. After all, I’ve come so far from being that tiny girl who questioned whether I could even wield enough command to handle directing film cast and crew as short as 12 months ago. And now, I have made at least 4 short films, have 3 others in the works and a major feature in the planning. And most of all, those lovely folks who gave me and my tiny stories a go are eager to work with me again as I am eager to work with them too. What was holding me back all those years after finishing my study? Fear. What was I doing every single day till that fateful day after Valentine’s Day last year? Regret. Regret not having enough guts to go ‘hell, I’m gonna try before I die’. That was pretty much what gave me a final push, whether I was willing to let go of a dream and regret it all my life, or whether I was gonna give it a try. I voted for try, and try I did. Firstly, I released my debut novel despite fear of criticism. Then, wrote my first short film and took it by its horns. It is my deepest belief that one is not a writer until someone else gives you that title. Before this, I used to say I want to be a writer. Nowadays, I say I am a freelance writer and filmmaker. It feels bloody good to be able to say that. I may not be known yet, I may not have the whole skill set yet, but I am learning, I am trying, and most of all, I am happy. So, do yourself a favor. If I can give you one advice then it is this: truly try before you give up on a dream, you never know the strength that lies in you till you hit that fork in the road and you must choose. Choose wisely and give it all you got.